21 November 2018: Ahead of the launch of her long-awaited new album Phoenix this Friday, 23 November, pop phenomenon Rita Ora has confirmed an exclusive New Year’s Eve performance at scene-shaping Maldives luxury resort Amilla Fushi. It has been a momentous year and a half for Rita. Following a sold out European tour, her last five hit singles have amassed over 1.3 billion Spotify streams worldwide – with global hit, Your Song, written by Ed Sheeran and Steve Mac, reaching more than 352m streams alone. She released global Top 10 hit Lonely Together, a collaboration with Avicii, in August, and in October her single Anywhere earnt a #2 spot in the UK. Further collaborations saw Rita team up with Liam Payne on For You for the Fifty Shades Freed soundtrack, her fourth Top 10 hit; and Cardi B, Bebe Rexha and Charli XCX on girl-power anthem Girls, another global success. These hit songs all feature on her new album. The Amilla elves are busily wrapping up days and nights packed with enchantment and wonder for this festive season. As well as the star-studded New Year’s Eve performances – open to all island guests at no extra charge - festive foodie surprises are also in store. Chef Hiro Nakamura charts an incredible journey of flavourful Japanese cuisine to Amilla’s signature overwater restaurant, Feeling Koi, showcasing a selection of artfully crafted sushi, nigiri and sashimi by the water’s edge. There’ll also be lip smacking themed nights at the chilled-out foodie hub Baazaar and enchanting dining experiences in the magical Mystique Garden. Australian football hero and former Everton player, Tim Cahill, will also be on island inspiring young footballers with a four-day festive training camp. Kids aged from 5-8 years, and teens from 9-16 years, can perfect their skills on Amilla’s very own full-sized pitch with elite coaching from the Socceroos’ all-time leading goal scorer. 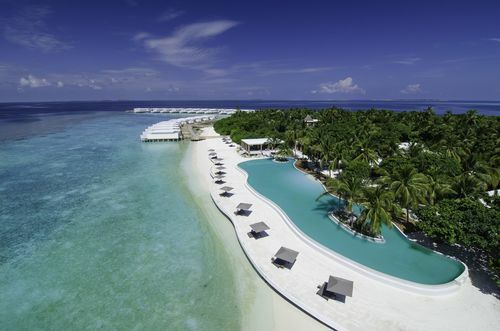 Red Savannah (01242 787800, redsavannah.com) offers a week’s festive holiday at Amilla Fushi from £5,919 per person - saving from £3,668 per couple - including seven nights in an Ocean Reef House accommodation, daily breakfast, return flights and seaplane transfers. The Small Maldives Island Co’s main focus is on Resort Management in the Maldives for Coastline Hotels and Resorts. Kate Faulkner (kate@bacall.net), Sarah Harvey (sarah@bacall.net) or Nat Frogley (nat@bacall.net) at Bacall PR Ltd or Tel: +44 (0) 207 360 2880. This press release was distributed by ResponseSource Press Release Wire on behalf of Bacall PR Limited in the following categories: Men's Interest, Entertainment & Arts, Leisure & Hobbies, Women's Interest & Beauty, Food & Drink, Travel, Media & Marketing, for more information visit https://pressreleasewire.responsesource.com/about.